In the old IUPAC system the letters A and B were designated to the left (A) and right (B) part of the table, while in the CAS system the letters A and B are designated to main group elements (A) and transition elements (B). The old IUPAC system was frequently used in Europe while the CAS is most common in America. The new IUPAC scheme was developed to replace both systems as they confusingly used the same names to mean different things. The new system simply numbers the groups increasingly from left to right on the standard periodic table. The IUPAC proposal was first circulated in 1985 for public comments, and was later included as part of the 1990 edition of the Nomenclature of Inorganic Chemistry. a Current, modern IUPAC group number. 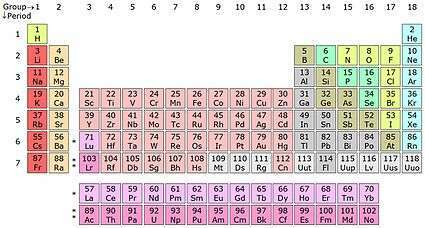 b The noble gases had not yet been discovered at the time of Mendeleev's original table. Later (1902), Mendeleev accepted the evidence for the existence of the noble gases, and placed them in a separate "group 0". c Hydrogen (H), while placed in column 1, is not considered to be in the group alkali metals. e This group name is not recommended by IUPAC. 01 !Group 1 1A !IA 1A !IA lithium family alkali metals* Hydrogen resides within this column, but is not considered an alkali metal. 1 2 Fluck, E. (1988). "New Notations in the Periodic Table" (PDF). Pure Appl. Chem. IUPAC. 60 (3): 431–436. doi:10.1351/pac198860030431. Retrieved 24 March 2012. ↑ Leigh, G. J. Nomenclature of Inorganic Chemistry: Recommendations 1990. Blackwell Science, 1990. ISBN 0-632-02494-1. ↑ IUPAC (2005). "Nomenclature of inorganic chemistry" (PDF).